It’s time to admit it out loud: This has been a rough summer. 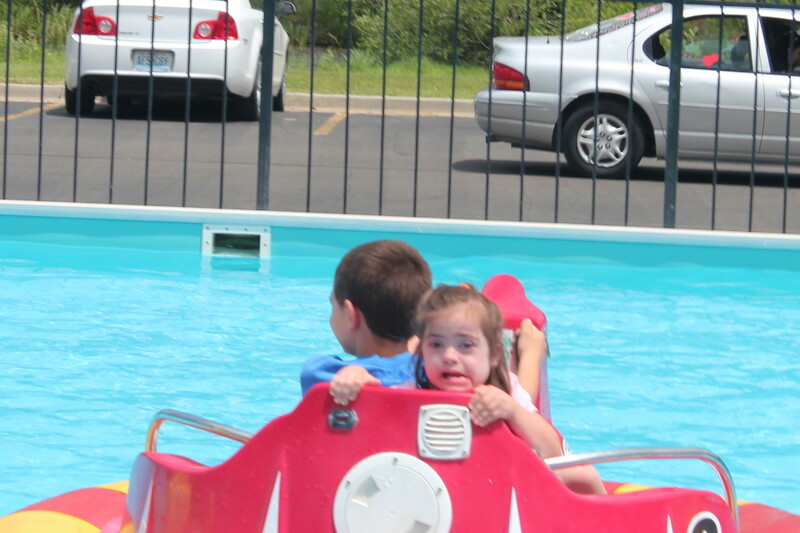 This is the first summer since Julianna came along that I haven’t had regular “respite” care. Our county provides services to people with special needs and to their families, and until last year, the biggest things they’d given us were the iPad and “home based support,” i.e. respite care. I always felt a little weird about taking that service, because it isn’t like Julianna’s disability is so severe that you can’t find a babysitter another way. I felt like I was cheating by taking it. And yet those 22 hours a month, it turns out, were a real sanity saver. Most parents of a six-year-old can expect her to be able to help out around the house. To dress herself. To be able to perform simple tasks without having to stand over her and issue step by step instructions. You sure don’t expect her to be a toddler-level mess maker. One day recently Julianna dumped the UNO deck, the Cars & Trucks counting deck, the Disney snap deck, all the Memory cards, and the entire Eric Carle alphabet game on the basement floor. It took me an hour of bullying, focused solely on her–well, I practiced my flute, so the time wasn’t totally wasted–to get her to clean up that mess. I thought the pain of that experience would teach her not to repeat it. Nicholas, meanwhile, has reverted to his poor-choices routine. He draws these lines in the sand over nothing, and he defends them like they’re the only thing standing between us and the total annihilation of the human species. He will eat dinner, but only after everyone else has finished, if you cajole and threaten and load his fork for him. He does it because it causes inconvenience, and because when dinner is over and it’s time to go to choir practice, for instance, and we will no longer let him eat, he can consider himself deeply victimized. He actually chose to skip dinner altogether one night. It was that important to him. It’s an attention bid, but there’s only so much attention to go around. I’ve been including him in cooking times, and several mornings this week we’ve cuddled. I help him get dressed sometimes, because I know he likes that. But he’s determined to demand more than the share that is possible to give him. And then there’s Michael, who started toilet training with a bang at 17 months, and after a few weeks learned we were only going to make him sit there for five minutes, and he was capable of holding it until we put a diaper back on him. It’s one thing to have a child start asserting himself that way; it’s another to go two months without even one successful bathroom visit. We took three weeks completely off in the hopes of resetting, but he returned to the process even more stubbornly determined not to succeed. Now, the current philosophy in a situation like this is “wait until he’s ‘ready’,” but that philosophy is a luxury made possible by disposable diapers. Michael does not use disposable diapers. You cannot wait until age 3 or 4 (which I find patently ridiculous in any case) when you’re using cloth diapers. So Friday I spent the entire morning sitting with Michael on the toilet: 10 minutes on, 5 minutes off, waiting out his ability to hold it. And it worked. In the last three days we’ve had half a dozen successes; he’s learning that we’re serious about this. But those two and half to three hours I spent sitting in front of a toilet were hours I really needed to get the floors mopped and papers filed, to say nothing of the column and the bulletin insert due this week. To top it all off, the kids have spent the entire summer fighting with each other All.The.Time. I see my own temper reflected in Alex’s short fuse, and I realize how much I need to corral and redirect myself, because he is absorbing my habits. I post things like this with a wince, because it’s inviting judgment. People are inevitably going to tell me what I’m doing wrong, or how I need to do less, but what? I have virtually no deadlines this summer; I barely spent any time writing last week, because I was focusing so much on family matters. In fact, that’s been the story of the entire summer: every two weeks or so, I get one productive writing day by paying a sitter; otherwise I’m snatching ten minutes in between family commitments. I have much to be grateful for, but it doesn’t change the fact that this summer is really hard. And I sit here in the dark on my NEO so I can pound the thoughts out before 5:45a.m. Jazzercise without getting sidetracked by the internet, but it’s a little too honest. A little too raw. And I wonder if all parents feel this way, whether they have two typically-developing kids four years apart in day care or ten smooshed together at home. And if so, is this stress just the price we pay for the gift of having them at all? Or is it, like everything else, an invitation to fall upon grace and be broken open to make room to grow? Personally I think this post makes you sound extremely human. I am sorry it has been rough. I know a little how you feel…at least on the potty-training. Vincent did the same thing!!! We are in “reset” mode right now and when school starts I will give it a go again. Hang in there! School starts soon! You summer sounds like mine. Violet is 3.5, just about, and we are struggling with potty training. Gabriel makes a mess out of EVERYTHING and shrieks like a banshee if he is even slightly irritated about anything. And getting the older two to help around the house is like pulling teeth. Plus working full-time and being pregnant… I want to get off this thing, too! It’s a rough season of life, that’s for sure. See, that sounds worse to me. 😦 Maybe we both need to call a family meeting! If you don’t have bad times as a parent, then you’re not a parent. Parenting stress is part of trying to be a good parent. It’s OK. Just breathe, be kind to yourself and know that you’re doing fine. In the picture, your kids are having a grand ole time….that right there is the only reassurance you need. They have had a good time…that’s true. Thanks for the encouragement. I am very blessed to have my husband home with me all summer so I have a lot of freedom that others don’t have. But I do have a kid. And even though u only have one it is still hard during the summer. He is constantly bored and/or wants nothing to do with my suggestions. As a teacher I always see the relief on parents’ faces when they bring them on the first day of school! You are definitely not alone! Only 20 days until you have some breathing room!! Daniel is 4 and FINALLY ready to potty-train. Yes, well, he’s in a little different place than typically-developing kids. I didn’t get Julianna trained until right before Michael was born. She was 4 1/2. You express well what every mother has thought. No judgment here, just appreciation for you being a committed mom who keeps going in. Each day is new. You got this. I’m so with you on everything!! We have four kids too, and special needs, and went from 15-20 hours a week of babysitting to less than six with a mother’s helper at the beginning of the summer. (And a nursing preemie newborn). Yikes!! Your summer sounds much like mine. Hang in there, mama. School is coming soon. Sending a virtual hug. I only have one son (as you know) and there have been so many days this summer when I wanted to pull my hair out! Sending prayers your way…. Death is often referred to as Eternal Rest for a reason. HAHA! Now that was a good laugh.